Q: What was the hardest part of your trip? On the bike, it’s usually when I planned too aggressively and got into trouble reaching my goal at the end of the day. This happened once in Mexico in Tepic, where I didn’t realize that the last 20km or so involved nearly 1000m of climbing. So instead of 1hr it took me more than 3 hrs, in the dark, on a busy highway, tired, with nowhere to go but to continue. Similarly, in Patagonia I rode into a strong headwind all day to reach El Chalten, and after 8 hrs (!) the wind gusts got so strong that I had trouble holding the bike upright even when stopping. Not wanting to camp out without food in the storm I had no choice but to push on, arriving after dusk and completely exhausted. The cold and rainy days on the Carreterra Austral in South Chile were also very hard, but more psychologically. In the mountains, one very hard stretch was the last pitch high on Argentina’s Aconcagua called Canaleta. We ditched our backpacks to reduce weight and every step was exhausting. It seemed incredibly slow, but the weather was near perfect and we were early in the day, so we continued all the way to the top, where I cried tears of joy and relief. On Ojos in Chile I ran out of gas at about 6000m after a bad night with no sleep, and had to turn around when I realized I couldn’t safely do the round-trip to the summit at the slow pace I was going. And on Chimborazo in Ecuador, the weather was horrible, with zero visibility, storm and freezing fog. It had blown snow into the shelter over night through the cracks in the roof! Only one other party had even attempted the ascent because of the weather, and they turned around after about 3hrs. As it was my last peak I really wanted to get to the summit and so stubbornly pushed on for 8hrs into the storm. Q: Which part of the bike ride did you enjoy the most? A: The Pacific Coast Highway in the United States is very a rewarding stretch with often magnificent scenery. Perhaps the most impressive were the Redwood Trees, especially the ‘Avenue of the Giants’ near Fortuna; those 30 miles were the only portion where I seriously considered going back just to ride it again. Crossing the ‘Puente de las Americas’ over the Panama Canal was a very emotional moment for me as it meant reaching the end of the North and Central America portion in Panama City. And cycling above the shores of Lake Titicaca in Bolivia was probably the most scenic of the entire adventure. Q: How do you prepare for such a trip? A: Simply put, the best way to prepare is to do smaller adventures, say a 2 week ride or long-distance hike. Reading a book or doing online research may get you valuable information, but there is no substitute to real-world experience when it comes to evaluate how you deal with -25F cold or thin air high up in the mountain. More specifically, the major areas are: Equipment, Logistics, and physical / mental preparedness. Obviously you need a good amount of equipment, from the daily camping and cooking to the bike and mountaineering gear, especially for glacier travel and very cold weather up in the mountains. As I joined commercial expeditions on the first two big mountains (Denali in Alaska and Logan in Canada) I used the online checklists of those outfitters as well as a book called “Climbing: Expedition Planning” to prepare on the logistic side. That said, if you are considering an adventure of this magnitude, you likely are an avid mountaineer and therefore already have much of the equipment anyway. As for the bike, I chose a recumbent bike, mostly for the comfort of riding many hours every day. Since I had never owned such a bike I did some research, bought a used bike, had it tuned up a bit and then did about 500 training miles on it to become familiar with it. Logistics of such a trip can be pretty daunting. There are many things to consider such as immunizations, visa, insurance, etc. Here preparation and early planning are key! For example, signing up for the major expeditions and organizing the transport of yourself and your gear. In my case, since the high mountains can only be climbed during a short climbing season, I needed to figure out how to get there by bike at the right time of the year. This was the main reason for me to break the ride into two halves: First ride South from Alaska to Panama (starting in the Northern summer), then fly to Patagonia and ride North from Ushuaia towards Colombia (starting in the Southern summer). Finally, I chose to interrupt my trip a few times and fly back home to rejoin my family. This required additional flights and equipment storage. As for physical and mental preparedness, I think people tend to overestimate the need for the former and underestimate the need for the latter! You don’t need to be an Olympic athlete to ride your bike a few hours every day. I would even go so far as to say that for the cycling you just need to start doing it. If you’re not used to riding much, just start with shorter daily distances. Once you start, you automatically get stronger and more used to it. For the mountains, there are few technical difficulties, but general fitness is required for the multi-week expeditions on the biggest mountains. For an adventure of this scope you need to prepare mentally. You will face adversity, discomfort, and hardship. There will be moments where your patience will be tested and you might even be tempted to give up. Unless you are in the right frame of mind you may not get very far. I have read of cyclists who didn’t last the first week on the Dalton Highway. You need to be comfortable either with being by yourself or with whoever you’re riding with as such a trip will test any friendship. Interestingly, for endurance adventures like this one there is a very wide age range. Younger folks tend to be stronger physically; older folks have more strength on the mental side. This can be a journey of lifelong growth and development. Q: Have you ever been in a dangerous situation or felt unsafe? A: On the bike, people advised against cycling through Mexico due to the drug violence. My own experience with the locals was always positive and friendly. Once in central Mexico I rode past a group of about 50 men working with machetes cutting bushes along the highway. They were all wearing what looked like prison uniforms, with heavily armed officials standing guard at both ends of the group. As I was passing the machete-wielding inmates slowly riding uphill, I felt oddly out of place and very vulnerable. Thankfully, nothing happened. Honduras was seen as somewhat unstable due to contested elections, but I stayed away from the capital and didn’t see any unrest. In Guatemala a pickup truck passed and stopped in front of me, with three armed men in civil clothing jumping out and waving me to stop. For a moment I thought I was in trouble, but it turned out they were simply curious about my story and wanted to take photos of me and my bike. My biggest risk on the bike by far came from narrowly passing cars or trucks, which happened in many areas. And my only encounter with criminal activity was an attempted robbery by two young girls in Mendoza opening and reaching into my little backpack when walking from my hotel to a restaurant. In the mountains, the biggest hazards come from bad weather, crevasses or avalanches. On Denali and Logan I felt safe due to the precautions of the guide and the expedition infrastructure. On Aconcagua we once descended to camp during an electric storm on a featureless slope which exposed us to the risk of lightning strike – I was really scared as beyond basic precautions there was nothing we could do at that point. On Nicaragua’s Mogoton the area near the top has some landmines from a past border dispute with Honduras. Seeing the effects of exploded mines next to the path made me a bit uneasy and definitely provide an incentive to stay on the trail. On Peru’s Huascaran there is an area below the Col de Garguanta somewhat exposed to icefall which has killed people before and prevented many expeditions in years past when conditions were deemed too risky. We were the first group up there in the season that year and crossed it both times up and down very early before sunrise to minimize the risk, but this was still an area of high objective risk. For this reason, Huascaran is the only mountain of this project that I would not do again. Q: What did you learn from this project or how did it change you? A: Some friend wrote in an email “Welcome back home after this life-changing adventure!” It gave me pause: Was it life-changing? Not in fundamental ways. I prefer to think of it as life-celebrating. It was more enriching than altering my beliefs or philosophy. I got to see so many places, meet so many friendly people, learn a new language, and learned about myself, my (often complex) motivations and my (often basic) desires. I got to think about what’s important in life and what’s not, about how limited and precious our time is and how people all over the Americas are so different in appearance, but yet so much alike in their personal aspirations. Most people I met were very friendly, curious and supportive of my trip. I had been nervous about a few countries like Mexico or Nicaragua, but they were a pleasant surprise to me. It made me appreciate that the perception one has about remote places (often from the media) can be quite different from the reality one experiences when actually going there. In simple terms this was an athletic and psychological challenge of new dimensions for me. I planned it systematically, pursued it with discipline and enjoyed the journey. In reflecting back, I think I have been realizing my own potential by stretching my legs and lungs to new limits, which is very satisfying. And last but not least my trip has been a source of inspiration to many others, which to me is one of the most rewarding feelings of all. For a somewhat philosophical answer, check out my post titled ‘Reflections after coming home‘. Q: The big question: What’s next? In my twenties, I flew around the world. 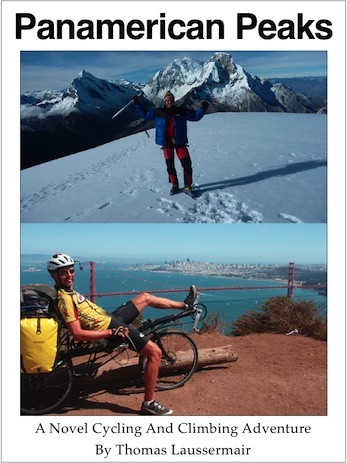 In my fourties, I cycled (half-way) around the world. In my sixties, I will sail around the world. As always, the journey is the destination!